What do you need a printer for? Is it for printing letters, bills, receipts and so on? Do you also want to be able to print photographs, greeting cards and help create children’s projects? So will you need a color printer or will a black and white printer suffice? Do you need a printer with a memory card reader (required if you want to be able to print a lot of pictures directly from memory cards)? Will you need very high quality printing? If so, you will want to examine the possibility of getting a high end printer with higher resolution. Do you need a fast, heavy duty printer – as in do you envisage having to do a lot of printing on a daily basis, or will your requirement be occasional; easily met by a cheaper, compact printer? Will you need a printer with a built in scanner (the scanner can also double as a photocopier) and a built in fax machine? 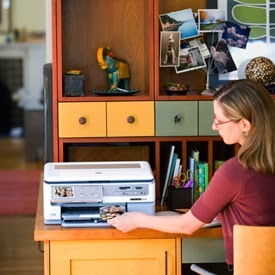 Does it make sense for you to get a wireless printer? What is your budget? When considering this factor you also need to look at the running costs of a printer – the prices of printer ink is also something to consider. Do you need a printer with a display? This can be simpler to understand than a bunch of blinking LED lights. Canon Pixma MX922 Wireless Office All-In-One Printer – This is an economically priced all-in-one printer that copies, faxes, pints, scans and even prints on discs. It has an auto document and is Wi-Fi enabled. However, this is not a very fast printer so it may not be suitable for high volume printing. Epson WorkForce WF-3520 – This is another reasonably priced all in one printer that also does duplex (double sided) printing. It can also print via cloud. However, if you need the output quality to be very high this may not be the best choice. Brother Printer Work Smart MFCJ870DW Wireless Color Inkjet – This again is an all-in-one printer with scanner, copier and fax and has low operating costs. Epson Expression Home XP-410 – This is a compact small all-in-one wireless inkjet printer that has affordable replacement cartridges (lets you replace the color you need instead of having to replace all the colors). This versatile printer is a bestselling Epson product. HP Deskjet 1000 Printer – If your budget is tight, this basic, no frills color printer from HP may do you quite well. The recommendations above not only have all the requirements for being a dependable home printer, but each has their own unique feature. Choosing either one will depend on your personal needs and preferences. For more recommendations and tips, subscribe to our mailing list and follow us on Facebook.